Well after a flurry of news items last week, there hasn't been much to report this week. 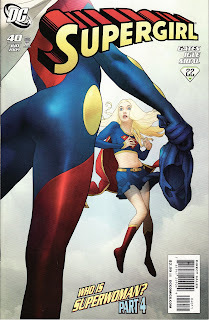 That allowed me some time to delve into the back issue box for a Supergirl comic to review. Since Reactron has played such a big part of the current title, I thought I would review his first appearance back in The Daring New Adventures of Supergirl #8 from June 1983. This issue sports a cover by comics legend Gil Kane. The whole Daring New run of 23 issues was written by Paul Kupperberg and drawn by Carmine Infantino. In my younger years I didn't appreciate Infantino's art style. As I have aged, I have come to like it more. For one thing, I think he draws a lovely Linda Danvers. The series was set in Chicago where Linda was attending Lake Shore University as a graduate student. 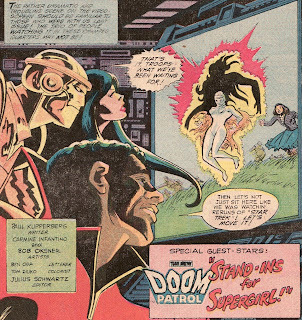 This issue also stars The 'New' Doom Patrol which was also created by Paul Kupperberg. In fact this reads more like a DP issue than a Supergirl one. Linda is kept on the sidelines for the majority of the story. The issue starts in a park where Linda (seen on the background monitor screen) is enjoying an afternoon with her friends. 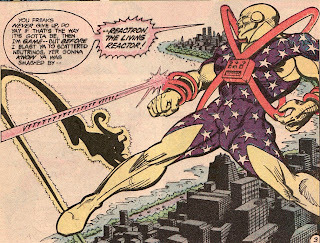 The Doom Patrol have been tracking Reactron across the country and trailed him to the windy city. Negative Woman was sent to the park to try to force him out into the open. The plan works and we get our first glimpse of Reactron, the Living Reactor! That's sort of a garish outfit for such a tough talking guy. But his speech and demeanor here is similar to the current version's gutter talk. Unfortunately, as much as Linda would like to join the battle, she just can't seem to get away to change into Supergirl. First she is stopped by Doom Patrol member Tempest who tells her to 'act like a good little citizen and run away in panic'. Despite his warnings, she intends to lend the Doom Patrol a hand. But before she can slip away, Linda's friend Daryll grabs her and tells her that they can't stay in such a dangerous environment. Reluctantly Linda gets into a taxi her friends have hailed and drives off. Using her super-senses, Linda keeps tabs on the battle. 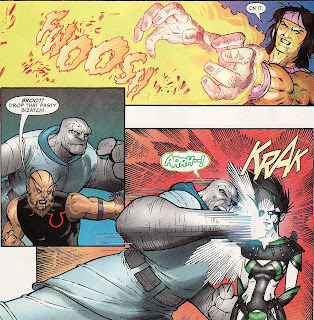 This version of the Doom Patrol had a bit more offensive punch than the prior version and are able to fight Reactron to little more than a stalemate. Realizing that he may actually lose, Reactron uses his powers to create a 'concentrated stream of particles' which allows him to warp away. 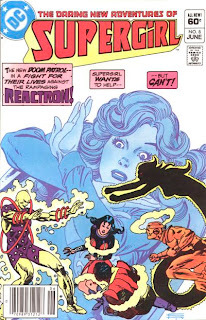 The Kryptonian super-senses are full display in this issue as Linda is able to deduce not only how Reactron's powers work (focusing his radiation through the control rods on his costume) but also that this teleporting trick is not something he can do frequently. One thing I really liked about this series was that Linda/Supergirl was pretty confident in her abilities and would typically fly right into the fray. Even here she vows to be on hand when Reactron appears again. I love the determined look on her face in that last panel. My guess is that Kupperberg wanted to showcase his Doom Patrol a bit. So he made Supergirl not be able to join the battle in order to protect her secret identity. Something else I liked about this title was that we actually saw a lot of Linda's personal life. Yes there was the zany man-crazy roommate and the usual number of failed romances. But we also saw some of her academic career. 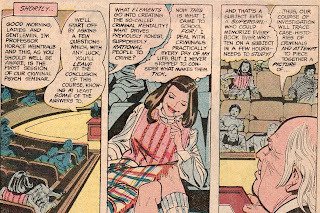 Linda went to LSU to study criminal psychology as a way to help her Supergirl career. I thought that was an interesting part of the title and showed how Supergirl was always trying to improve as a hero. But LSU also is a typical Silver Age-y campus meaning that its science building has a fully functional albeit experimental nuclear reactor humming away in its science building. And for a villain like Reactron who absorbs radiation, this reactor is like an 'all you can eat' buffet and the plans for the reactor could help set him up for the future. He breaks into the science building and a security guard crosses his path. 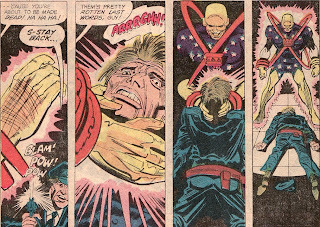 Without much thought, Reactron grabs the man and kills him. The current Reactron and this Reactron seem to have the same murderous sociopath personality. I wonder if Gates used these issues as his template for his Reactron. 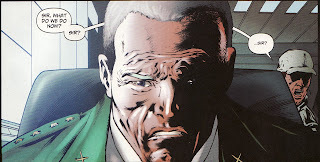 Certainly the current villain is more like this one than the philosophical bank robber from the Puckett issues. 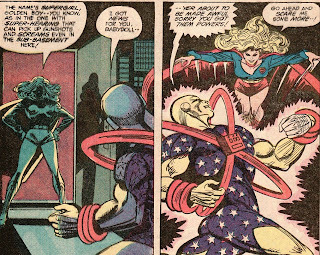 Of course, the guard's gunshots and death screams are heard by Supergirl who shows up to face off with Reactron. That's right, we finally see Supergirl in this issue even if it is only in the last 2 panels. Nice cliffhanger for next issue (which I will review with the next trip to the back issue box)! I really like these last panels. The first has Supergirl in a very classic heroic pose but the shadowing of her face and costume makes her appear menacing. I think that's a nice touch. Kryptonians should be frightening to criminals. I also like the banter she gives Reactron in the last panel ... daring him to 'go ahead and scare' her more. It is almost as if she is saying 'ooooohhhh .... scary' in a mocking tone. 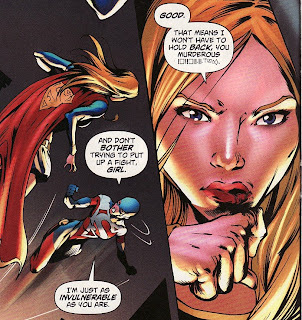 As I said, this serie's Supergirl was pretty confident, sometimes even overconfident. You have to read these older issues through the lens of nostalgia. 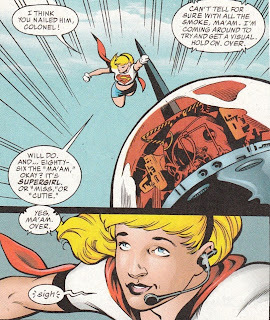 Supergirl barely appeared in the issue. There was some magical Silver Age (Bronze Age?) 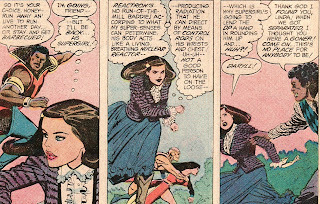 moments ... Reactron suddenly being able to teleport, Supergirl's senses able to figure out just about everything. But there were some nice Linda moments. Still, I think this would be a nice part of a Supergirl collection, especially given the importance of Reactron in the current continuity. This is probably $1-3 at most conventions, maybe less on line. 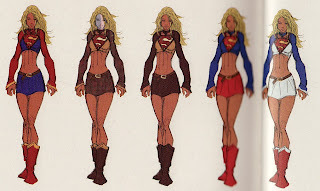 I recently posted about Jamal Igle's proposed redesign of Supergirl's costume. And, as usual, there is a lot of talk on line about Kara's costume in general ... much of it focused on Igle and Matt Idelson's inclusion of bike shorts under her skirt. With all that talk still resonating, I thought I would post some of Michael Turner's ideas about the costume. It is interesting to see how he took pieces of some of his different concepts to piece together Kara's current look. Looks like the belly shirt was a unifying theme to his thoughts. These pictures are from the back pages of the Superman/Batman:Supergirl trade. Sorry for the lousy scans for pics that crossed the binding. In this look we see the belly shirt and mini skirt look. Her boots are the classic Superman boots she wears now. But notice the short sleeves. Interesting. I like how Turner played around with a variety of color schemes. I really like the first iteration with dark blue shirt and red skirt. I would have been very happy with that costume. The all white version is interesting, a play on the animated/later Linda Danvers look. The last 2 in this series wouldn't have worked for me. Those powder blue boots look hideous. This string looks very similar to our current uniform albeit with no cape. I kind of like the shorter looser appearing pirate-y boots. And here we have the gold ringed trumpet sleeves. Add these sleeves to the sketches above and you have the current costume. For some reason, the red skirt and long blue sleeves is not as pleasing to me as the short sleeve version of the same color scheme above. I definitely don't like the earth tones or war paint. This last series seemed a bit too similar to Wonder Girl's uniform for my tastes. 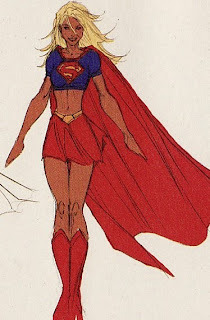 A sleeveless belly shirt and pants just doesn't say Supergirl to me. Again, there is no cape. I think this look has a little too much of a 'harem girl' feel to it as well. But again, the different color schemes contemplated are sort of fun to look at. Anyways, I think Turner put together a fresh look for Supergirl. I am more of a fan of the Matrix look. But if we were going with the belly shirt, I think I may have preferred this 'short sleeve dark blue shirt, red skirt' version. What do you all think? Any of these strike your fancy? 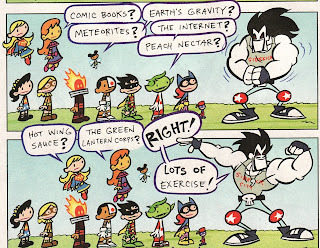 Tiny Titans #16 is another fun issue for older fans and the Johnny DC crowd. And anytime Kara is featured I figure a review is in order. While the other Titans are usually the fodder for jokes, Supergirl always seems above the fray. I think that is an interesting wrinkle to this book. As I mentioned when the book was solicited, the cover is a nice homage to this 1970's Treasury Edition comic which reprinted some Superman/Flash races from the past. Even the breakdown of who is rooting for who is similar. 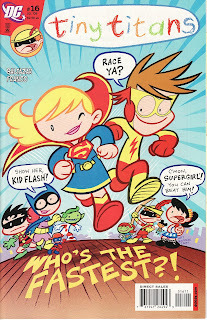 Alas the issue isn't merely a Supergirl/Kid Flash race. Coach Lobo is having a hard time convincing the Titans that they need to exercise. He asks them what they think gave him all his muscles. Their answers are pretty silly. These are only 2 panels ... there are a couple more. To drive home the point he tells the Titans that there will be an around the world race. 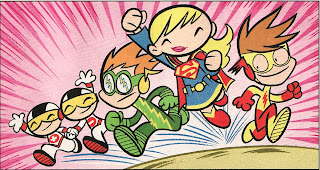 The speedsters ... Supergirl, Kid Flash, and Inertia ... take the task in stride. In fact they seem excited. The rest of the group is not as happy. How the heck are they going to accomplish that! Raven immediately drops out of the race and heads for the library. She tells Lobo that she doesn't run. The race goes along swimmingly until the pack reaches the coast. The water-based Titans and Beast Boy shrug their shoulders and take to the water. 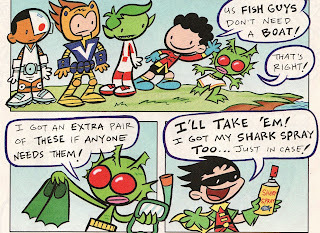 Robin is given a snorkel and fins and joins them. I love how he says he brought his shark spray. Is it a reference to Adam West and his 'Bat anti-shark spray' from the old Batman movie? And this the same month that a 'some days you just can't get rid of a bomb' reference in Super Friends! Unreal. Two Adam West Batman movie references in one month! Us old guys can't get enough Easter Eggs. Don't ask me why I got such a kick out of this. But Batgirl had a bat-copter stashed at the coast and takes off in it. The group of speedsters continues undeterred .... cruising across the desert and picking up Mas y Menos along the way. Don't ask me how they can lose to someone swimming. I don't think I am supposed to be thinking that critically. But the first person to cross the finish line is Raven, fresh from her trip to the library. Then all the rest of the Titans careen across the finish line, barreling into Lobo in the process. Still he names Raven the winner! 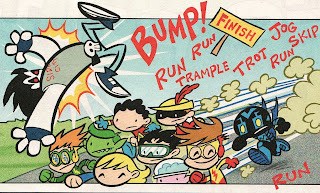 As usual, Art Baltazar continues to mix enough DC history and all ages fun into this title. Happy Memorial Day everyone! Hope everyone is enjoying the three day weekend. I figured, given the holiday, I would show Supergirl fighting along side our military. After all, today is the day we should honor our veterans. 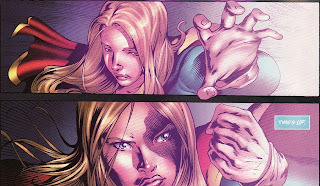 So here is this panel from Supergirl #60 written by Peter David and pencilled by Leonard Kirk. 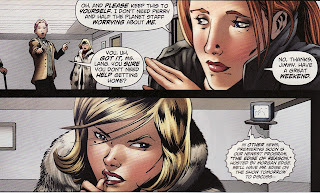 Here Linda Danvers takes part in the worldwide battle against Imperiex in the Our World At War storyline. 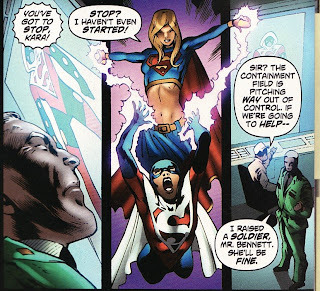 Flying alongside Colonel Blackhawk, Supergirl attempts to stop a probe from destroying Leesburg. I already reviewed the supertitles and Codename:Patriot issues coming out in August. But the truth is there are other issues that will impact Supergirl as well. Since we all are going to need to start saving up for the summer, I figure I would post these as well. The team continues its proactive hunt for justice as the trail leads to an army of Super-Villains. But the big bad may be deadlier than all of the new team combined... Continuing the anticipated 6-part miniseries event from James Robinson (STARMAN, SUPERMAN) and rising star artist Mauro Cascioli (TRIALS OF SHAZAM)! A proactive hunt that leads to an army of super-villains? Robinson on a team title with a character named Starman. Lush Cascioli art. While my excitement for this has diminished over the year it has taken to come out, I still think it will be a fun ride. I think that seeing Supergirl in a team book with veterans like GL and GA should be very interesting. And my guess is, as a proactive team, we are going to see a very tough Supergirl putting the hurt on some bad guys. All the stories and teams in Wednesday Comics are fantastic. But the super-teams in particular are very strong. I can't wait to see Bermejo's art. And Palmiotti and Conner on a super-pet story should be an unbelievably fun ride. I am very excited about this weekly. Well, at least we know where Eddy Barrows is! I can't wait to see his art here. But I, for one, feel bad for Kal-L. I thought it was completely appropriate that he was the final hero in Crisis on Infinite Earths. That was so fitting. So I cringed when he was brought back as a dupe in Infinite Crisis only to die all over again. And now he is being brought back as a zombie Black Lantern. I don't know. I am sure it will be a good story. But we already had the perfect ending in COIE. So between Blackest Night, Wednesday Comics, Justice League, and Codename:Patriot, August is going to be crammed with Supergirl goodies. Supergirl #41, released this week, was labeled the finale to the 'Who is Superwoman?' arc but in some ways it didn't feel like an ending. After last month's Lucy Lane reveal I was hoping that this issue would answer the myriad of questions that I had. What was Lucy's motivations? How did she get her powers? Why go through all this deception? Some questions were left unanswered; some answers were hinted at. Now I don't need to be spoon-fed my comic stories. Heck, I read Grant Morrison and sort of liked Final Crisis. Still, when an arc is built around a mystery, I think readers deserve the answers. Now next month's issue is listed as 'Questions and Answers, Epilogues and Homecomings' so maybe more information is going to be revealed there. Maybe this was the 'action' issue and next month is the 'exposition'. Still ... I really was hoping for more information here. I went into this issue with some expectations that weren't met. Maybe I am just a month early. As we saw in the Newsarama preview, General Lane had a front row seat for the battle between Supergirl and Superwoman. 'Why' would Lucy put on an S-shield and do the things all the things she has done? When I reviewed the clues after the Lucy reveal, I wondered if one of her motivations might be besmirching the S-shield and the House of El. 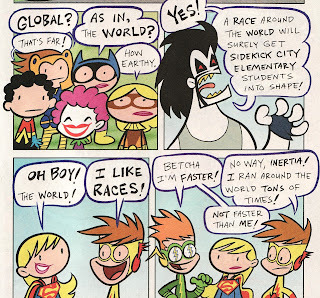 I also think that Lucy is trying to earn the love of General Lane and Sam Lane hates Superman. So Lucy acting as Superwoman and doing evil would accomplish both goals. Here she hints that I might be right. She tells Kara that the Superwoman charade really had little to do with Supergirl specifically but more about the House of El in general. She points to the S-shield and says 'it's about this'. But it is a hint of motivation ... not a straight forward answer. And even Supergirl recognizes that. She tells Lucy that isn't an answer. Lucy responds that all mysteries aren't easily solved. In a metatextual way, it felt like Supergirl was acting the part of the reader and Superwoman was acting the part of Sterling Gates in a Q&A session. We as readers want cut-and-dried answers and they aren't coming yet. 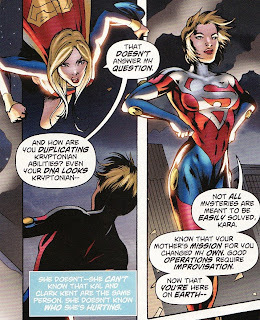 One thing that is also revealed is that somehow Lucy's DNA now appears to be Kryptonian. So at least part of how she has her powers is known. By being organically derived we have an explanation for her heat vision and strength. Of course, this seems to contradict her immunity to Gold K. Of course, when I thought Superwoman was a Kara clone I explained it away with the suit. Lucy does reveal that she still wants to be flying under the radar. The discovery of her killing Agent Liberty forced her hand a bit. So she flew to Metropolis to destroy the evidence, kill Henderson and then kill Supergirl, in essence implicating Kara for the Liberty murder. Sure sounds like she wants to tarnish the El family's reputation. 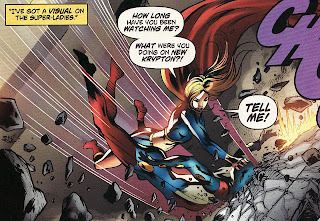 One thing that was good about this issue was that we actually got to see Supergirl cut loose. Superwoman had a hand in Zor-El's death, has deceived Supergirl with friendship, and has murdered Agent Liberty and possibly Inspector Henderson. Superwoman is evil and so deserves to be beaten to a pulp. In fact, Supergirl is soooo mad she calls Superwoman a murderous 'babootch' a monkey-like animal from Krypton. Hee hee ... 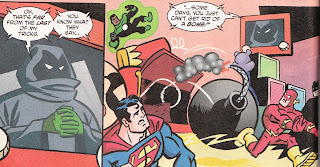 I love obscure Silver Age Superman references. Supergirl actually gets the upper hand smashing Superwoman through the walls of the Police Station and temporarily incapacitating Lucy. Again, we see Supergirl asking all the questions that I want answered. Why was Lucy on New Krypton? How did she get there? At least Sterling Gates understands what the readers want to know. In the meantime, Lana has recovered from her nosebleed/fainting spell enough to be released from the Emergency Room with the plan for outpatient testing. I don't know if I like that look from Cat Grant. I think she is intrigued enough about the night's events to start digging into Lana's life. Can some investigation into Linda Lang be far behind? Before Supergirl can figure out exactly what to do with Superwoman, Reactron rejoins the fight. There is a great and humorous moment earlier where a couple of kids on the street mistake him for the Atomic Skull. 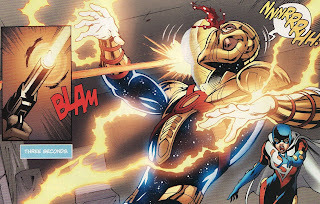 Reactron wades into the precinct, quickly depowers Supergirl with his Gold K, and slaughters a few police officers. One thing that was slick in this fight sequence was Kara actually counting down the fifteen seconds until her powers kick back in. As we read her mentally counting down the time, it added a nice layer of suspense to the scene. We are counting along, hoping the villains are stalled enough for Supergirl to get back into the fray. Luckily ... amazingly, Inspector Henderson is able to recover from his heat vision chest wounds. (As a doc myself, I wonder how that's possible ... but anyways.) Noting wryly that lead stops Kryptonite, he shoots Reactron in the eye. I always knew that skull mask didn't provide enough protection. Despite his powers, Reactron is just a guy. A bullet to the eye should stop him if not outright kill him. This was my favorite moment in the book. When the fifteen seconds finally elapse, Supergirl says 'time's up' and makes a fist. There is such determination and anger and power in that panel. Wonderful. When Reactron was shot, he accidentally destroyed one of the yellow disks on Superwoman's costume which caused a feedback of some sort. Lucy screams in pain and is out of commission for a short period of time allowing Kara to recover. Figuring the disks are some crucial part of Lucy's power grid, Supergirl starts ripping them off and crushing them. 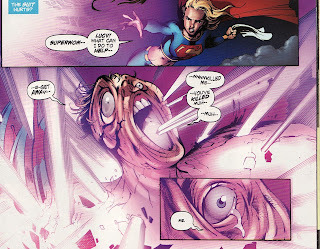 As Kara destroys them, Superwoman begs her to stop. Lucy tells Kara it isn't the disks at all. I suppose if she has some quasi-Kryptonian DNA than it isn't the disks. But when they are destroyed it does seem to hurt Lucy. Even the Project 7734 folks watching the fight note that Superwoman's 'containment field' is in severe flux. After destroying all the disks and pummeling Superwoman, Supergirl rips the S-shield off Lucy's uniform stating she doesn't deserve to wear it. It is another great moment ... one of pride in her family. I can't believe that 2 years ago Supergirl hated her insane father and was trying to kill Kal. Unfortunately destroying the suit seems to have a greater effect on Lucy than smashing the disks did. Lucy's body becomes suddenly unstable contorting and expanding until she literally explodes. Pretty disgusting. It reminded me of Tetsuo at the end of Akira. Her body simply couldn't contain the power. 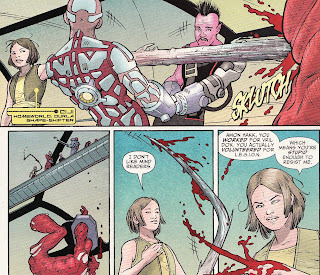 At least we know why Lucy was glad Reactron didn't compromise the suit in issue #39. Brrrrrr. One guess is that somehow General Lane was able to splice Kryptonian DNA into his daughter giving her powers. However, this amalgam proved too unstable and so needed to be fortified by a containment field. The same field may have shielded her from any Kryptonite exposure. Or her hybrid genome may have made her immune to K-radiation. The suit and disks somehow provided that protection. But this is educated conjecture rather than revealed truth. But here is my latest guess and it's one I like. I wondered about the purple color of the energy swirling around Superwoman and if that has some significance. Could it be Phantom Zone energy? Could Lucy be somehow possessed by either a Phantom Zone criminal or even one of the Phantom Zone phantoms from Joe Kelly's run? That would explain a lot. It would explain the grudge against the House of El, how Kryptonians are 'her people', why her DNA looks Kryptonian, how she had a place to go to on Kandor, and even partly explain the powers. That would explain why Sam Lane said 'I know who you are' to Superwoman/Lucy ... he knows who is possessing her. That might even explain why the suit needed to protect her ... it kept her in our dimension. Without it, she popped back into the phantom zone. Supergirl didn't kill 'Lucy', she put her back into the Zone. This was my second favorite moment of the book. General Lane actually shows some emotion, some grief over the death of his daughter. It is the first crack in his armor that I have seen since he was re-introduced in New Krypton. 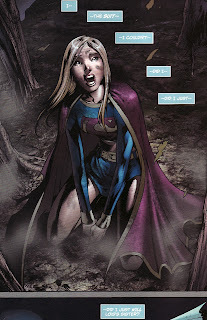 The issue ends with a somewhat battered Supergirl wondering if she killed Lois' sister. So this is a tough issue to grade. The truth is that there was a lot to like. It was great to see Supergirl show some resilience and finally throw down ... show how powerful she is. It was great to see her thrash Superwoman. There were some powerful individual moments. And we learned some things about the hows and whys of Superwoman. I thought Fernando Dagnino did a fine job standing in for Jamal Igle. In particular, I think the fight sequences were done very well. His stuff here seemed to be more polished than the recently released Codename:Patriot covers, maybe due to Raul Fernandez inks. (That said, I am looking forward to Igle returning). But my expectations might have been set too high. I was really hoping for more information about the Lucy reveal. The whole mystery of 'Who is Superwoman?' is somehow lessened since I still have no understanding of Superwoman's origins and motivations, of the small details like her time on New Krypton or why she would befriend Kara. Now all of this might be revealed in next month's epilogue. and maybe I am jumping the gun a bit. But without getting that information when expected, I felt just a little let down here. As for Supergirl, sales are encouraging. I still feel that stability is crucial in the comic market. But adding readers has to be a good thing. So sales for Supergirl actually went up with Supergirl #40 which sold 34,080 issues. Supergirl #39 sold 33,713. It is a modest leap of about 1% but this really is a wonderful thing with the title keeping readers in a tough economic time. It also is a tribute to the solid story and art in the title since Gates/Igle took over. Readers must like what they are seeing as sales remain stable rather than jumping ship like they were over the 2 years prior to Supergirl #34. Here is a look at recent sales with some comments. It seems like outside of crossovers like New Krypton (or the upcoming Codename:Patriot), that sales hover around 34,000. We can always hope that more readers continue to slowly accrue. This issue was the Superwoman reveal and so a few new readers may have picked up the title to see who was under the cowl. But there was no variant cover or other gimmick. And there was no link to an overall Superman title other than the green triangle. Let's hope the new readers stick around. The same increase in sales can be seen with Supergirl: Cosmic Adventures in the Eighth Grade #5. Hooray! The penultimate issue sold 6,576 units. 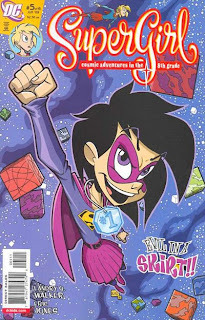 Supergirl Cosmic Adventures in the Eighth Grade #4 sold 6,200 issues. This is an increase of 6% but also the most the title has sold since the second issue! Now sales where up across the board in April but still an increase in sales of this size for an All Ages title is great. I have to think that word of mouth ... everyone has gushed about this title on-line ... may have finally filtered out so that new readers sought out the title. I wonder at what point DC decides that a Cosmic Adventures sequel is viable. If we don't hear anything by November will we assume that nothing will be happening in the future? I really hope DC realizes how well received this title was. So overall great news on the sales front for Supergirl fans. 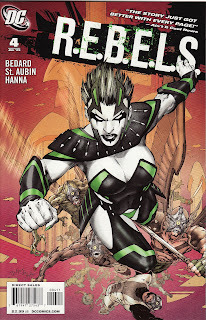 R.E.B.E.L.S #4 came out last week and was another fun and fast-paced issue. Hopefully a quote from 'Aint It Cool News' and an Ed Benes cover will bring in some new readers. The 'stars' of the book, Brainiac 2 and his newly formed group of rebels, surprisingly only appear in 5 pages of the issue. But this is a intergalactic book. There are a lot of players in this storyline and it all seems to be coming to a head. But I am getting ahead of myself. The issue starts on Earth of all places where bounty hunters Amon Hakk, Getorix, and the red alien telepath are being held in a prison in Antarctica. Before they can face trial here, they are turned over to another group of aliens. It is a humorous scene as a huge space warship looms over the prison. They are given over to this young girl under the 'hand em over or be vaporized' treaty. Hakk, a Khund warrior, scoffs at being handed over to a child. Well it turns out that child isn't just a child. Nope ... Captain Ciji is a Durlan and uses her shapeshifting abilities to calmly murder the group's telepathic colleague. It is done in such a crude and quick fashion that you sense that Ciji is really an awful individual wrapped up in the sheep's clothing of a young girl; it is a frightening combination. Ciji demands that Getorix track down Tribulus which will of course lead them to Dox as well. My sense is Ciji's motives are more than just the bounty on Brainiac's head but we'll need to wait and see. 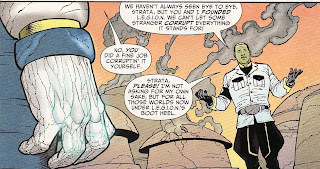 In the meantime, Dox is on Cairn still trying to convince Strata to join him in his quest to regain control of L.E.G.I.O.N. It is tough to get a read on Dox because he is so self-serving. He will do or say most anything to get what he wants. He tries his best to explain the Legion programming from Brainiac 5. He plays on Strata's sense of pride ... of not wanting the name of L.E.G.I.O.N. to be corrupted by someone. He leans on her sense of justice ... wanting to free the planets L.E.G.I.O.N. has taken over. He even says please! While I would buy these sentiments from most anyone else, I can't trust Brainiac to be doing all this out of his sense of fair play and rightness. Of course that distrust is a double edged sword. He might be speaking from the heart here! We learned that the villain behind this whole L.E.G.I.O.N. turmoil was in fact Starro, including the woman on the cover of this month's issue. 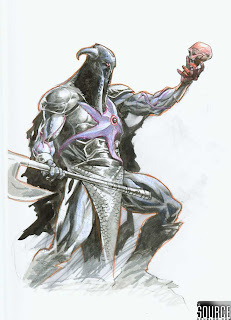 But we also have seen over on the DC blog The Source ( http://dcublog.dccomics.com/2009/05/12/starro-unleashed/ ) that Starro has been redesigned by JG Jones and Bedard to this more 'Frazetta Death Dealer' like being. So it is only a matter of time before this warrior shows up. 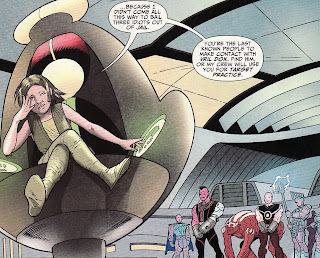 In the meantime though, the Omega Men are facing off against this Starro puppet. She says the usual thing that folks assumed into a hive mind say: there is no war, famine, disease .. only peace. I think the Body Snatchers, the Borg, the drones from Zzzazala all have said the same. The Omega Men aren't hearing it. The vaporize the spores she shoots to enslave them. And Broot attacks her with a vicious right cross. Amazingly, the Starro-woman doesn't budge. She looks almost bored by the attack, arms folded behind her back. Hmmm ... did anyone else think she looked a little Czarian in appearance? And Lobo was part of the L.E.G.I.O.N. book. Despite her shrugging off their attack, the Omega Men are able to escape the building albeit followed by a horde of Starro slaves. The whole planet Maltus appears to be under the telepathic starfish's sway. We cut to the another big player in the intergalactic power schema ... the Dominators. They have discovered a manmade wormhole near Dominion space. The Emperor and his cabinet begin eliminating groups as being responible. The Khunds aren't smart enough. It is too obvious for Durlans. It is too subtle for Okaarans. When those choices are eliminated, the wormhole must have been created by whoever took over Maltus. And the Dominators still don't know it is Starro. 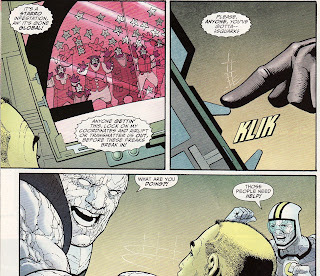 I love how the Emperor fears Dox saying whoever was able to beat Brainiac is a threat to the Dominion empire. Talk about respect! 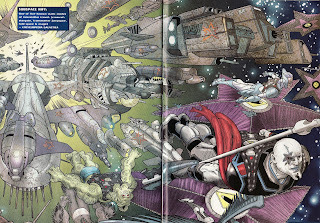 But the wormhole means that Starro is able to easily invade Dominator space. The Dominators have come close to taking over the universe on their own. If you they get absorbed and added to Starro's forces, Starro might be unstoppable. Brainiac's ship arrives in orbit above Maltus just in time to receive a distress call from the Omega Men revealing the Starro threat. This scene is Brainiac at his Dox-est. Without a second's hesitation he closes the communications leaving the Omega Men to their fate. It is simple math for Brainiac. There is no way their small group can save the Omegans from Starro, to try would be suicide. Better to run. Strata isn't as coldly calculating. She realizes that running from Maltus is signing a death warrant for their friends. The two begin to argue about what to do next. My guess is they will often be at odds. Before they can decide on a course of action, the ship is attacked by Captain Ciji's ship. 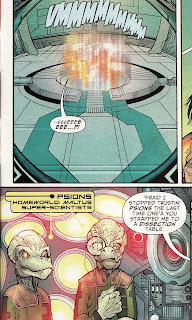 The space surrounding Maltus is stuffed with the bigger threat of a Starro invasion force. Despite this threat to the entire sector, Ciji is singleminded in his pursuit of Dox. Talk about not seeing the forest for the trees! Luckily the Omega Men are rescued but by an unlikely group of saviors, the Psions. Unlike Ciji, the Psions can see the big picture. They need every able bodied person to help fight off the armies of Starro. And man, it is an armada! Here is a shot of the Starro forces pouring out of that Dominion wormhole. That's a lot of warriors! I have said it about the prior three issues and I'll say it again. I am liking this title more than I thought I would. 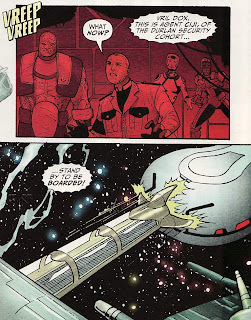 Tony Bedard is juggling multiple comic continuities and galactic politics but seems to have a grasp of them all. And this is such a far-reaching comic with a section of the universe at stake! What happens here won't effect Earth now ... but it could eventually. Despite not seeing Brainiac (the most fascinating character in the book) and the R.E.B.E.L.S. for most of the issue, it flowed well enough that I did not feel cheated. In fact this read more like an Omega Men book and I don't care for any of those guys. The art by Claude St. Aubin had the same micro-detailing of the Andy Clarke issues which preceded this issue giving the book a consistent flavor. 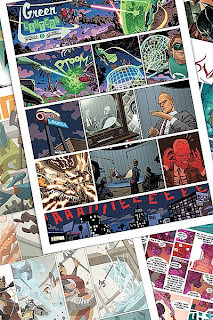 Lastly, I know some friends have commented on how this storyline seems to be copying some of the beats from the Marvel cosmic books such as Annihilation. I don't read those books so really can't say one way or the other. What I will say is that this opening arc seems to be building towards an explosive 'space battle' showdown.